In early 1924 Anatoly returned to Russia illegally, he wanted to see his mother and friends. After his visit he returned to Finland on the 23rd February 1924, by skiing across the ice of the Gulf of Finland. (This may seem a fantastical journey looking at today’s maps, but the boarders were different then and the town, Terijoki that the family had been living in when in Finland is now in Russia. The journey was about 50 Kilometers. I think it is possible that he had gone to a place he already knew.) As he made the journey he was intercepted by security personnel. He apparently put up an armed resistance but was nevertheless arrested. One entry on the 10 the February 1925, describes a visit where she had rushed to the prosecutor’s office, and received permission to visit Anatoly for about an hour, she was second in the queue. Anatoly was depressed, he said it would be a year on the 23rd since his arrest and if it is all 25 is so uncertain he would go on hunger strike. His mother advised against it as his case was being decided in Moscow and it does not depend on local people. But after a few minutes the visit was stopped and future visits banned because he was eating an apple which was forbidden. But Ekaterine remarks that another prisoner nearby was eating milk with crackers. What affect her pleadings had is not clear, on the 16th February 1925 Anatoly was sentenced to death by the Collegium of the OGPU. However on the 2nd of March that sentence was changed to take account of the revolutionary achievements of his father Esper, to imprisonment in a concentration camp for 10 years. He was to serve his sentence at the Solovetsky camp of the OGPU. The OGPU was the secret police, sometimes part of the NKVD. It later became the KGB. Solovetsky camp is on an island in the middle of the White Sea about 800 Kilometers from St Petersburg. The conditions in the Solovetsky camp at that time were not as bad as they later became. Anatoly became a fellow of the Solovetsky Local History Society and published an essay on his work. The Society became active in studying and recording the local flora and fauna and eventually conducted a complete scientific survey of the Solovetsky Islands. A lot of Biologists and Naturalists found themselves swept up in arrests and were sent to the Solovetsky Camp. There was a strong community of scientists there. After a while Anatolly was transferred to Pushhoz, part of the Solovetsky island group where he worked under a Finnish man, Carl Gustavovich Tuomaynen. Tuomaynen had served a three year sentence in the prison but remained after his sentence had been served under contract with the Secret police (GPU). Tuoamaynen was engaged in a programme of breeding animals for fur. They tried Cats and Dogs but cats were discontinued, then they tried Silver Foxes. They founded an industrial nursery for fur animals. They further experimented with Sable and the American Muskrat. It was the acclimatisation of the Muskrat to the local conditions which Anatoly concentrated on and succeeded with. 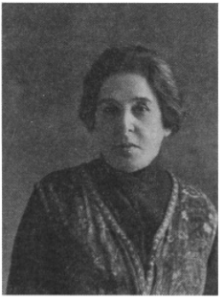 Figure 12 Ekaterine Serebriakoff. Photograph sent to her son. The work on the fur farm seemed to attract less attention from prison guards and the food and accommodation were of a reasonable standard. Though at some point he seems to have suffered with a fever and was in hospital for 6 weeks. He was constantly in touch by correspondence with his mother and in her diary she keeps a numbered record of the letters. Ekaterine sent him a picture of herself inscribed on the back “My strong and well son from his mother, 1 XII 27”. In July and August of 1929 Ekaterine visited Anatoly at Solovki. She seems to have spent 40 days with him. She reported that Toll feels good and hoped that he would be released soon. Figure 13 Anatoly Serebriakoff in Solovki. 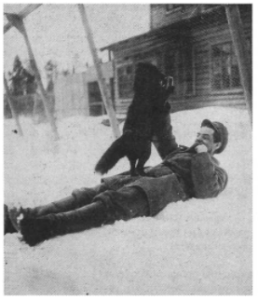 The next picture is of Anatoly lying on the snow playing with what looks like a dog.